The aluminum screen ceiling is a type of shielded ceiling, and the visual effects of the space can be adjusted while hiding the pipes and other facilities, and it can make the light in the room mild. This aluminum screen ceiling made of aluminum alloy plate and keel is easy to install and remove. This ceiling installation and disassembly provides sufficient space for future maintenance. This type of ceiling does not lose sound absorption and isolation, and does not affect the installation of broadcasters and other facilities. The aluminum screen ceiling is streamlined and elegant, to ensure the light and softness of the light. The height of the aluminum screen ceiling can be adjusted freely and the viewing height can be adjusted at any time. The product is completely shielded from plumbing and is fully compatible with fire and air conditioning systems. Suitable for building materials, airports, subway stations and other large venues. The aluminum screen ceiling is a kind of aluminum ceiling, which is named for its long shape. The aluminum screen ceiling is also called the hanging curtain hanging piece. It is a card-type curtain. The creative design concept of the louver is applied to the ceiling. The visual height of the space can be adjusted, the pipeline facilities are hidden, and the decorative effect is extraordinary. 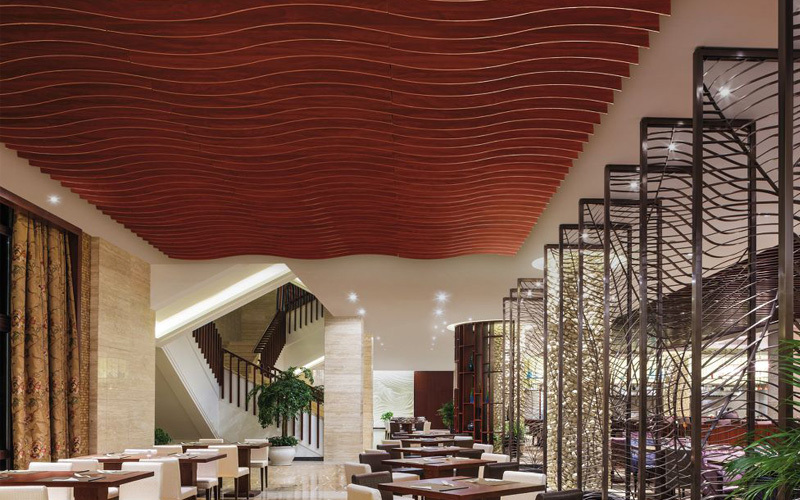 The aluminum screen ceiling is an environmentally-friendly decorative material that has been widely promoted by relevant national authorities and has achieved remarkable results. It is now widely used in large public places such as subway stations, airports, and bus stations. The aluminum screen ceiling is highly versatile and neatly arranged to facilitate the layout and arrangement of ventilation and fire sprinklers without affecting the overall visual effect. It can be matched with the open frame system, the color is uniform and uniform, and it can be used indoors. The quality is guaranteed for 10 years. The connection is firm, each piece can be repeatedly assembled and disassembled, and it is easy to match various lamps and devices to facilitate equipment maintenance.